You'd have to be a cockeyed optimist — or at least have a wry sense of humor — to name a Seattle band Blue Sky. But that's what drummer John Bishop did, back in the '80s, and he's at it again. Bishop is the force behind one of the most wildly optimistic jazz ventures ever attempted in Seattle, and he's making it work. For the past five years, with little fanfare and a ton of elbow grease, he has been running a local jazz label, Origin Records, out of his Ballard loft. To date, Origin has produced 45 quality CDs. Over the past four months, four Origin titles were in the top 60 albums aired on jazz radio, nationwide, according to Yellow Dog Report, which tracks jazz radio airplay. Reviews of Origin albums have turned up not only in local magazines but in the New York Post, JazzTimes, All Music Guide, Cadence, and on the highly respected Web site AllAboutJazz. Last month, Origin got so big, Bishop and his partner and former student, Matt Jorgensen, moved its headquarters to a separate office and spun off a second label, OA2. This month, Origin kicks off a weekly series at Tula's in Seattle. Origin appears to be on the verge of revitalizing a local jazz community that has been curiously stalled for some time. "I've often thought," says Bishop, "that if somebody came to town and they went out to hear music at one of the standard venues, what impression would they go away with? I know all these great players, but you never hear them doing their own music. Something has got to happen as far as getting the good music out there." Origin is doing just that, by documenting a vibrant jazz scene that exists in Seattle but rarely gets heard. Take Jeff Johnson's trio, with the brilliant, feathery-toned saxophonist Hans Teuber, and drummer Billy Mintz, represented on Origin albums "Free" and (with pianist Randy Porter) "The Art of Falling." Or the remarkable quartet on "Scenes," with Johnson, Bishop, saxophonist Rick Mandyck and guitarist John Stowell. 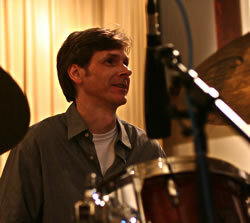 Or drummer Steve Korn's sophisticated, driving sextet, with Johnson, trumpeter Jim Knapp, tenor saxophonist Rob Davis, guitarist Dave Peterson and pianist Marc Seales, represented on the album "Here and Now." Every one of these groups is producing creative, original small-group jazz with a Northwest flair. But the only place you can hear them, at least with any regularity and in their optimum configurations, is on Origin Records. "I think it's one of the best, most consistent independent labels in the country," says Nick Morrison, music director of the area's jazz station KPLU-FM (88.5), which currently is spinning several Origin albums. "The recording quality, the performances, and the art work are always really good, really attractive and professionally presented." Bob Rusch, whose New York-based company, NorthCountry, distributes Origin to Tower Records and other stores, agrees. "They either have a really brilliant business plan or they have resources behind them," says Rusch, who has seen many a small label come and go. "They've managed to grow, without selling out or getting into debt. And, more importantly, they seem to be patient. Organized and patient." Patience and organization are paramount in the disc business, where jazz accounts for an all-time low of 1.5 percent of all sales. Why would anyone in their right mind start an independent label in such a climate, much less one devoted to local, largely unknown players? "Some sort of freak idealism?" speculates Bishop, whose all-American-boy looks are tempered by chronic sarcasm. He adds, more seriously, "I have an obligation to get this stuff out there." 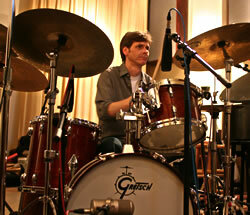 Bishop, 43, was born in Seattle, came up in Eugene, Ore., and has made a living as a drummer all his adult life. He's worked as a sideman behind jazz greats Bobby Hutcherson and Carla Bley, as well as toured with Buddy Greco and the Harry James Orchestra. Here in town, he is best known as the rhythmic anchor for the svelte and sophisticated trio, New Stories, with pianist Marc Seales and bassist Doug Miller. When he moved to Seattle in 1981, Bishop had no intention of starting a record label. But around 1993, his pals discovered he had an eye for designing CD covers and started paying him for it. Four years later, as he was designing three discs, including one for New Stories, a bell rang. "It occurred to us," he recalls, "that maybe we could keep doing this, and I could use this title, Origin, as an actual record label." Over the years, Origin has developed a compelling visual ID, featuring warm, soft-focus photographs and beautiful paintings with pungent, earthy colors. It also has become something of a cottage industry that includes the label proper; Bishop's design company, OriginArts; Jorgensen's Web-site company, OriginArts.net; and OA2, which will accommodate emerging artists. The label itself is a co-op. Musicians pay the cost of production; Origin does the design, marketing and distribution, sells over the Internet (through www.originarts.com) and takes a small cut. At the end of the day, artists own their product and sell most of it at gigs. The most popular Origin albums sell about 1,500 to 2,000 copies. If that sounds paltry, consider that midsize labels are happy with sales of 5,000 and that, today, 10,000 is a "hit." The Origin empire is all concentrated in one building. Jorgensen and his wife live in No. 5.; Origin Records occupies No. 8; and Bishop and his wife of one year, Leila, share the two, black-painted wood floors of No. 11, with a pair of curious cats, his drum set, some potted plants and a lot of paintings. "Leila lived in No. 7," Bishop said, with a smile. "And the person who married us lives in No. 10." Local musicians are delighted by the service Bishop is providing. "There are many people who just stand puzzled before this vast project of making their own CD," says Jane Peck, whose Let's Play Stella label has done for her husband, pianist Dave, what Origin does for the community. "John just makes it so simple for them. And he puts out a great product." Origin's roster is diverse, the standards high. The latest release of three albums is typical. "SRJO Live," the recording debut of the wildly popular Seattle Repertory Jazz Orchestra, features lively renditions of memorable concert performances. Saxophonist Mark Taylor and RadioAction's "After Hours" is dark and intense modern jazz. "Language" features the free-improvising trio of slash-and-burn drummer Gregg Keplinger, New York saxophonist Daniel Carter and bassist Reuben Radding. In spite of their musical range, Origin albums have a distinctive flavor, a quiet sense of flow, honesty and individuality which Bishop thinks derives from the Northwest's anarchism and isolation. "Guys spend a lot of time alone here, at home, working on their instrument," he says. "They're kind of introverted people, and that comes out in the music. When you go to L.A. or New York, the music has got this certain thing to it, and if somebody's sitting in, you can hear that they're trying to cop to it. But here, they're not trying to cop to anything, they're just doing what they do." For Bishop, Origin is more than a record label. It's a means of connecting the local jazz community. That's why tonight, at 8, he's launching a weekly, invitational jam at Tula's (2214 Second Ave., Seattle), featuring different members of Origin's extended family and their guests ($6; 206-443-4221). The first session features Bishop, bassist Paul Gabrielson and saxophonist Rich Cole. "Why can't you have local guys playing and people coming out to hear it?" he asks. "You hope that somebody smarter than yourself would put something together, but you see it not really happen, so what else do you do? You either sit back or you take it upon yourself." Since taking it upon himself, Bishop's life has changed. He plays less and talks on the phone a lot more, mostly to 150 radio programmers around the country. "I used to spend a lot of time doing nothing," he admits. "Just thinking. But the best part, to me, is it just feels like the early days of making music, when you show up to a gig and you're not sure you can cut it at all and then you play a couple of tunes and you go, 'Hey, that doesn't feel so bad.' And then one of the old guys turns around and goes, 'Yeah, man.' It kind of feels like that every day." All About Jazz.com has a nice feature on Origin Records and our latest batch of CDs ... read more. Los Angeles-based composer Chris Walden picked up two Grammy Nomiations for his debut CD, Home of My Heart, on Origin Records. Origin Records priciples John Bishop and Matt Jorgensen accepted the 2005 Golden Ear Award for Northwest Jazz Concert of the Year on behalf of Joe Locke and his performance at the 2005 Ballard Jazz Festival. Origin Recording artist Greta Matassa won the award for Jazz Vocalist of Year. In all, Origin Records received 12 nominations.